This post has 554 views. I’m a fan of Fullmetal Alchemist franchise, and therefore of course I watched the The Sacred Star of Milos movie. It’s another one of those things that I watched a while ago but never got around to posting about. The Sacred Star of Milos is an anime-original side story for the FMA:Brotherhood anime, and here is what I thought of the movie. Post contains minor spoilers. The Sacred Star of Milos takes place somewhere in the middle of the FMA:Brotherhood anime series. In the movie, our protagonist brothers Ed and Al track an escaped prisoner to Table City located on the border of Amestris and Creta. In the city, Ed and Al get caught up in an intrigue between the military within the city, the Cretans across the border and a group of refugees living in the canyon separating the city and Creta. 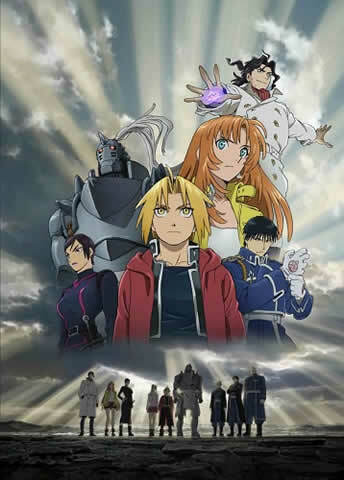 While the events of The Sacred Star of Milos take place in the middle FMA:B, it is an anime-original and stand-alone adventure that’s not related to main FMA story. We still see some familiar FMA characters and themes, as in addition to the Elrics the movie features Colonel Mustang, chimeras and even the Philosopher’s Stone. Of course, there is a cast of new characters in the movie to build the story, and female lead Julia does a decent job holding her own. The story of the movie is pretty intriguing (as with any plot that involves Philosopher’s Stones) but easy to follow, with some nice twists thrown in near the climax of the movie. I would say the story is worthy of the FMA franchise. Obviously it’s not as epic as the main story, but for a 2-hour movie it’s pretty decent. Other than the involving story, Fullmetal Alchemist is of course well-known for its alchemy-powered action, and The Sacred Star of Milos has plenty of fights. The action is quick, explosive and sometimes quite bloody. Bones made good use of the increased budget and made the final battle into an impressive sight. Of course, whenever you have Philosopher’s Stones the alchemy battles go to another level. Overall, I enjoyed the film. It is partly because I like FMA so much, but even on its own The Sacred Star of Milos is quite an entertaining anime film. I don’t really have much else to say about the film. Unlike the Conqueror of Shamballa which puts a conclusion/epilogue to the old FMA anime series, The Sacred Star of Milos is just a side adventure to FMA:Brotherhood, so that limits the topics I could think of.